The second round of matches for Group C saw France secure their place into the knockout stages with their win over Peru while Denmark and Australia split the points. The analysis of Croatia – Argentina from this day of fixtures will be uploaded separately. The game between Denmark and Australia had the potential to seal the fate of the two teams. With the French still to play Peru later the same day, a win for Denmark could have sealed their qualification from Group C.
The starting lineups were almost identical to the ones used by each team during the first round of fixtures. The only change came at the base of the Danish midfield, with Lasse Schone coming in for the injured William Kvist, having been substituted on during the early stages of their win against Peru. Kvist, an important player for Denmark in qualifying, is now out for the entirety of the World Cup. The Aussies remained unchanged from their courageous performance against France. Denmark gained control of the game fairly quickly, with strong possession in the opening stages. In response, the Australians dropped into a very compact (particularly horizontally) 4-4-2 defensive shape. One of the primary weapons in these early stages in terms of building play for Denmark was the sharp off-ball movements attacking the last line. Nicolai Jorgensen was particularly active in making movements in behind and attacking as a target for long balls. Eriksen’s reactions to and relationship with Jorgensen is a pivotal one for the Danes and certainly deserves further examination. But also a dangerous weapon, as is typical for Denmark, was the sharp movements of Jens Stryger Larsen, and particularly the long diagonal ball from Simon Kjaer into him on the left side. This has major advantages, due to the consistently excellent timing of Larsen’s runs. All it takes is one excellent pass and a dangerous opportunity is created. But also, aside from the explicit tactical advantages, it also has potentially interesting psychological effects on the opposition when utilised so consistently in such early moments of a match. Opening the possibility of playing into the area of this pitch creates a cat-and-mouse game whereby the Australians adapt by reducing the extremeness of their horizontal compactness. That is when gaps start to open inside for the likes of Sisto and Eriksen to exploit. The risky nature of the pass was, however, exposed on some occasions. With such aggressive movements from Sisto and, particularly, Larsen in attacking these balls, and due to the very long pass distance, there were moments when Denmark struggled to effectively counterpress the subsequent second ball situations. From the 4th minute of the match – Kjaer underhits the pass and Australia counter. The pass was more successful when utilised from a deeper position for Kjaer, rather than as a weapon to break down the deep block. This gives more room for inaccuracy in the pass, which makes a pass beyond the last line more likely. The Australian back line turning and then attempting to transition quickly having just dropped into the vacant space behind the back four is very difficult individually and collectively. It was only in moments where the pass was inaccurate in front of the back four that created the dangerous Australian transition moments. Even when the ball was overhit, this allowed Denmark to reset from a static position instead of being immediately countered. It is not clear whether this limits the potential psychological impact on the Australians, perhaps the intent of utilising these diagonal balls is more important than their direct success when trying to create small pockets of space inside the Australian defensive block. The opening quarter of the game was very well-executed by Denmark, and the goal was symbolic of that. The goal could be regarded as a very typical one for this Danish team. 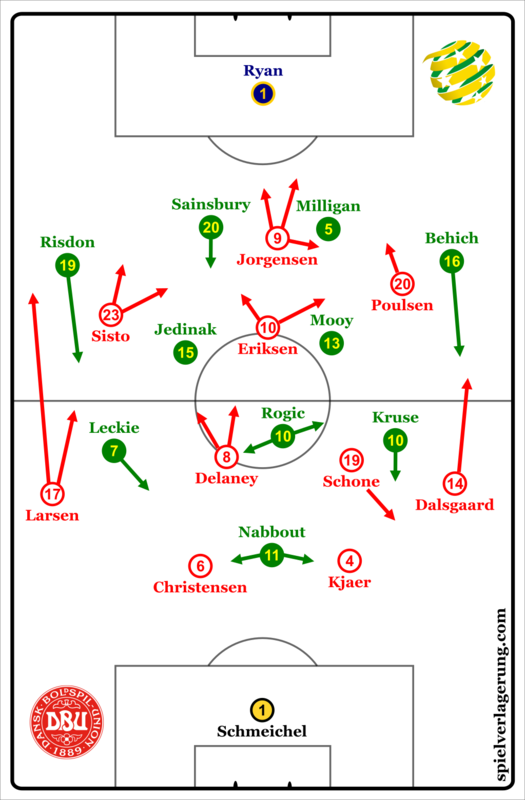 With possession lost from the throw-in on the left side, an immediate counterpress into quick combination play between Jorgensen and Eriksen created the goal. This was yet another example of Eriksen sparking moments of magic within the framework created by his team, rather than the expectation being that he create the moments of his magic for his teammates to react off, perhaps like Lionel Messi and Argentina. Denmark remained on top in the early stages, but Australia got a stronger foothold in the game the longer it went on, partly because of the success (and subsequent lack thereof) within the Danish mid-high press. This was much the same as it has been in qualifying and against Peru. Pressing in a 4-4-1-1 shape with one of the CBs offered as the first pass. In this case, play was forced towards the Australian left with Mark Milligan as the spare man. Play is almost always forced to that side, suggesting this wasn’t a ploy to keep Sainsbury off the ball in early build-up phases. It may be because it allows more direct 1v1 confrontations for Poulsen over Sisto, but perhaps more pertinently because it enrols Delaney as the midfielder temporarily 2v1 whilst his teammates orient themselves to their direct opponent. This relies on Delaney’s ability to recognise when to drop or advance, or aggressively react to pressing triggers. Whilst Schone may be slightly more comfortable achieving this than Kvist, it still would not be considered such a strength as perhaps it would for Delaney. However, this is a difficult role to undertake for the entirety of a game, and Australia were more able to exploit the press later on. Jedinak in particular was unable to punish Denmark for this setup in the early stages of the game. But as the game went on, and the midfield spaces opened, it was less of a requirement that Jedinak turn and play so quickly, and Australia were therefore able to get more sustained passages of possession by building through him. In the second half, they were also successful in utilising this fact when progressing play in semi-transition moments. In these moments, Australia found joy countering into the space behind Larsen, with Leckie looking particularly lively after beating a Danish counterpress, whereby Leckie can exploit the space behind Larsen or directly attack him in a 1v1. 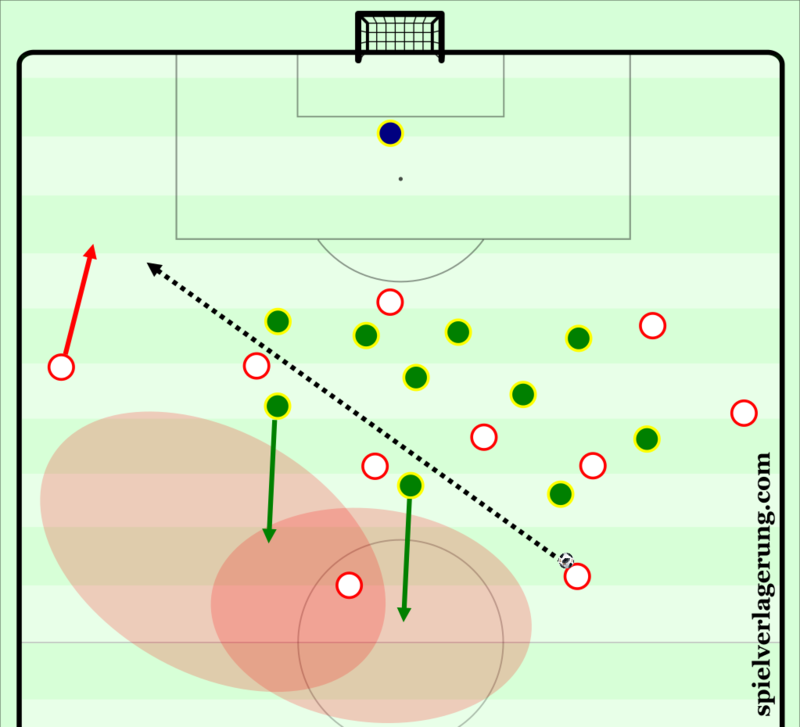 In situations where they were able to regain their shape, Denmark were forced backwards into a deep-block with both winger orienting to the Australian full backs. From such a deep position, it is difficult to for them to transition quickly, and as such a lot was required of Jorgensen in these moments. After the controversial VAR awarded yet another penalty decision, the game eventually descended into a somewhat scrappy affair, within which a draw could perhaps be considered a fair result. Denmark are now in a good position to qualify, but a loss for Hareide’s team and a win for Australia in the last round would likely to lead to qualification for the Aussies. Both sides needed a win entering this match for different reasons. If France were to win, they would secure their place in the knockout rounds. On the other hand, Peru would be eliminated if they did not get at least one point. Three points over the group favorites would be key to any late surge toward the Round of 16, losing a close match to Denmark in their opener. Each manager made a couple of changes to their team for this match. Didier Deschamps replaced Tolisso with Blaise Matuidi, alongside Olivier Giroud getting the nod from the beginning over Ousmane Dembele. Deschamps also adjusted the base formation slightly, with Matuidi playing a hybrid sort of role between a left winger and a central midfielder, akin to what Max Allegri has deployed with him (alongside other players such as Alex Sandro) at Juventus. Shifting from the 4-3-3 in the last match to a 4-2-3-1, Griezmann functioned as a normal 10. The rest of the team was largely unchanged respective to their roles. Peru started in the same 4-2-3-1 as the prior match with a few tweaks. Paolo Guerrero started up front at the expense of Jefferson Farfan, and Pedro Aquino also started the match after coming in as a substitute against Denmark. The inclusion of Olivier Giroud was critical to the performances of the French side in the run up to the tournament itself, and after the impact he had on the first match (assisted the second goal), it was difficult to imagine Deschamps not starting the Chelsea striker. With Dembele off, the left side of attack would now be vacated. This vacancy was filled by Lucas Hernandez, who took on a more attacking minded part in this match relative to the last match. 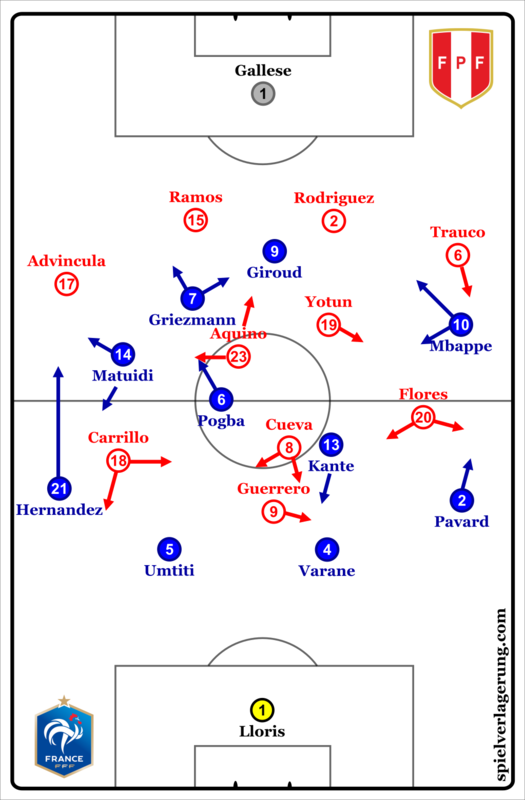 While Matuidi was listed as the left winger in the prematch team sheets, Hernandez was the most wide and advanced player on the left side, with Matuidi either sliding back to provide cover or support, or remaining in the halfspace in aid of circulation. With Paul Pogba on this side as well, France predominately built up from these leftward areas. Griezmann and Giroud both occupied the left sided half of the field more, boosting numbers for combination play when available. With this spatial focus on the left side, this afforded more space for Kylian Mbappe and Benjamin Pavard in attack. Mbappe occupied a wide starting position, trotting alongside the touchline while his team was in possession. Pavard was fifteen meters or so behind the PSG starlet, mainly acting as support with the odd overlapping run every now and then. Mbappe greatly benefited from this isolation, as he had more space to be able to dribble inside and destabilize the Peruvian defense. As he sprinted with the ball, more players would flock toward him, hence creating space for other Frenchmen to perform as Mbappe combined with them. When the teenager received the ball in these isolated positions, he was at his most effective throughout the match, unlike the Australia match where he was caught in congested central areas where he could not use his strengths optimally. His first half display with rewarded through scoring the lone goal in the match ten minutes from halftime. His wide starting position additionally helped with his runs in behind the defense. Since he can see down the line from the same vantage point as the linesman, Mbappe can easily gauge whether he is onside or not as the ball is played. Lucas Hernandez, while not as wide, functioned in the same way on the left side. The width he provided was more to push defenders out toward him and create awkward numerical and spatial dynamics for Peru to handle as Giroud and Griezmann moved in and out of neighboring territory. The frequency and variety of these passes that broke multiple lines or were played into depth were among one of the larger differences between the Australia match and this one. Depending on the recepient, there were a handful of line breaking passes that did not appear against Australia. With Olivier Giroud, his ability to handle aerial passes and long balls opened up the possibility for France’s defenders to play long balls and actually retain possession. Paul Pogba when closer to goal was one of the few players actively looking to play Mbappe in behind the opposition defense, creating some good looks for him that were just shy of scoring. Lastly, Lucas Hernandez’s newfound advanced positioning enable Umtiti and Varane to play cross field diagonal balls into space, with Hernandez running onto them and joining the attack in this manner. Hernandez moves up the left wing in his more attacking role as a fullback, with Matuidi covering. Giroud and Griezmann move to the left as well, This leaves Mbappe isolated in case he receives any passes from the opposite side. France’s attacking exploits improved relative to their last match, but still have the aura of conservatism about them that contribute to Deschamps unpopularity as the manager in both France and among fans. Pass selection was not overly ambitious, yet rather quite safe and only taking risks when the probably was high of having it pay off (not really that risky then, eh?). However, France managed to create some strong chances, partially due to issues that Peru had in their transition, alongside some improvements from their previous game. Peru: close, yet not quite. Peru have been one of the most entertaining teams of the tournament thus far, playing very good combination football in a quite unique fashion. Unfortunately for them, they have also not managed to score a single goal either, not managing to break the deadlock in either match besides having several promising looks. Against the French, they had similar moments of success but couldn’t manage to log enough high quality chances due to good interventions. The Peruvian attacking play is based off of heavily tilting their players toward one of the wings. By having many players nearby on one side, many options around the ball present themselves, permitting for fast circulation between players alongside fast counterpressure in case they lose the ball. This movement among the team is rather extreme, meaning that Peru play out of one side for most of their attack. Peru’s focus on the wings leads to some great combination sequences like this, where Farfan is able to receive with no pressure since Cueva and Guerrero each occupy players that could step up. No wing was clearly preferred in this respect, but the left side had more activity in the first half. With Cueva basing his movements toward that wing, Peru were able to get numbers for combination play quite easily and play open players. France’s medium block where pressure is not commonly applied led to Peru having a sizable share of possession. But the breakdowns they had were largely down to trying to dribble fast France’s defenders, alongside the superb anticipation and tackling of Kante. Once they were met with these players, Peru could not get past. Peru were quite fluid in terms of their movement sequences, with Andre Carillo moving across his line frequently in search of spaces to receive the ball and his teammates reacting well to him. On the right side, he was left isolated similar to Mbappe and Peru’s most potent player on the dribble. But this fluidity had consequences for when they adjusted into their defensive shape, as by the team Peru regained possession, there was on instance moments where there were no options to a side of the pitch they wanted to play to, simply because the other side was where they were previously occupied. They were slow to recognize these bits, and it led to the error that caused the goal conceded in minute 34. The second half brought changes in search of, introducing Jefferson Farfan and moving to a 4-4-2 to boost their attacking presence. Yet France did well to limit them to low quality chances. They were able to absorb the pressure with their compact low block and anticipate their combinations, with Kante having one of his best performances for Les Bleus throughout his international career thanks to his fantastic anticipation. Peru could not find the second goal as France restricted their spaces to play with and used defensive possession to have the clock tick. In terms of quality of scoring chances, it was a fair scoreline. Despite Peru playing interesting and intricate football, they managed few efforts on goal that threatened France besides hitting the crossbar in the second half. France move on to the next round, while we say farewell to Peru. Hopefully they have better success in an upcoming World Cup playing a style as fun as what we saw in Russia this summer.